Building muscle is the main aim of most men in the gym, but so many get it wrong. They focus on the wrong exercises, the wrong muscle groups and don’t eat the right foods. In this muscle building 101 I’m going to run you through the fundamentals of muscle building so you don’t waste your time in the gym. When it comes to building muscle, you can’t afford to neglect a body part. Don’t like training your legs? Tough – they need training more than ever! Not bothered about your back? You are now! 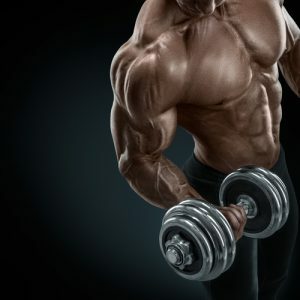 When we lift weights, we stimulate muscles to release growth hormone. The bigger the muscles we train, the more growth hormone we release. The large muscle groups such as the legs and back allow more growth hormone to be released than the smaller muscle groups such as the arms. Training arms is important, but it’s more important to focus on the larger muscle groups first. As a general rule, to build muscle we are looking for medium to high repetition ranges, typically 10-12 reps.
On occasion, mix things up with higher rep ranges, especially when training legs are they are bigger muscles with a much higher work capacity. The lower rep ranges with heavier weights are useful for building strength, but they do very little in terms of increasing muscle size and volume. Anyone who wants to build muscle has to eat a surplus of calories – you need more calories than usual because you are trying to build extra tissue. Importantly, you still have to eat healthily, you just need higher volume of food. Don’t worry about eating every 2 hours, but certainly try to make sure you are eating larger portions than normal – you need to give your body extra building blocks to create the muscle. Make sure you are eating plenty of protein (meat, fish, eggs), carbohydrates (rice, potatoes, pasta) and of course, plenty of fresh fruit and vegetables. Drink plenty of water and keep sweets and chocolate to a minimum. The exercises you should focus your training on are known as ‘compound’ exercises. Compounds are the exercises that train a lot of muscle in one go, such as squats (legs, glutes, lower back and core), pull ups (back, biceps), bench press (chest and triceps). 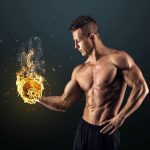 Only once you have performed these exercises should you move on to what are known as ‘isolation’ exercises (exercises that train single muscles) such as bicep curls. This is because you’ll build more muscle with compound movements than you will with isolation exercises. You can’t expect to build muscle if you’re not willing to work hard in the gym. Ask anyone with any level of muscle and they’ll tell you that it doesn’t come easy. You should be training to fatigue on every set. If you leave the gym feeling like you didn’t work very hard, chances are it’ll show in your results. Make sure your weights challenge you. If they don’t, you simply won’t build muscle. Keep your rest periods short, keep your workout intensity high and eat a sensible diet with plenty of protein – you’ll soon see the muscle growth! How Often Should I Train to Build Muscle? When it comes to building muscle, volume of training is important, but equally important is rest, recovery and nutrition. 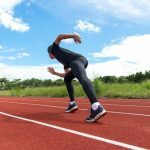 Training every day won’t give your muscles and connective tissues such as tendons time to rest, recover and repair. The muscle building process follows this pattern…. Training creates microtears in the muscle and signals to the body that the muscles need to be bigger and stronger. When you eat healthy foods and plenty of protein, you give the body the tools it needs to build the muscle. The muscle growth occurs when you rest and recover. Aim to train 4-5 days per week, with ideally no more than 3 training days in a row. You must allow enough rest to train properly. Do I Need Protein Shakes to Build Muscle? In a word, no. As long as you are eating plenty of good quality protein from sources such as meat, fish and eggs you shouldn’t need protein shakes. 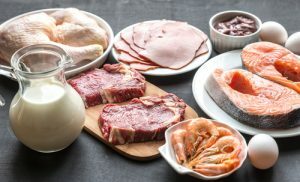 Make sure the food you eat is good quality, so keep processed meat to a minimum and you should hit your protein requirements quite easily with a couple of good sized (at least a palm size) portions of protein per day. The fundamentals of building muscle are simple enough. The hard part comes in the execution of these fundamentals – pushing yourself to work hard in the gym and making sure you eat a lot of healthy food. Get the fundamentals right and you’ll be building a lot of muscle, very quickly.